Any PPC manager who needs to batch modify keyword lists. Any Google AdWords user that wants to make better use of the keywords suggested to them by Google. Any search based advertising user that wants more control when editing or creating keyword lists. Any SEO who wants to create lists of keyword tags. Any digital marketing agency who uses programmatic tools for their Google AdWords management. Delete keywords that contain a specific term, in a specific location within said keyword. Delete keywords with a certain number of words. Remove repeated spaces or repeated characters. Remove unwanted characters, such as line feed, carriage returns and tabs. Remove character sets such as punctuations or all non alpha-numeric characters. Remove terms from the start of keywords. Add words to the start or end of keywords. Search and replace terms in a keyword list. Convert to lowercase or uppercase. Create misspellings – choose from duplicate characters, swapped characters, missing characters and qwerty keyword errors. Replace words and retain original keywords using the Replace Words and Duplicate option. 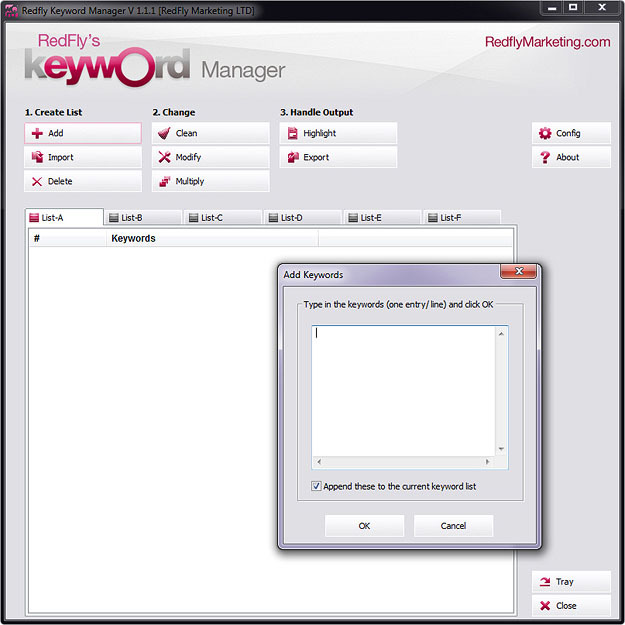 Assign Google AdWords keyword matching options to keywords. Highlight keywords containing specific keywords or with a certain number of words. Import and export keyword lists to text files. Export with commas separating each keyword. For a real world example of how we use this tool please read this in-depth blog post. There are some interface options available in the Config menu which give you the ability to change the font, font size and colour setup of the rows of keywords. This helps make the keyword tool that much easier to use when working with large volumes of keywords. If anyone has any feedback, bug reports or feature requests, please feel free to let us know. If you like this free tool, please help us spread the word about it.